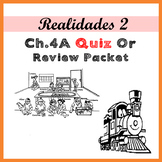 In this activity the students simply identify the pictured vocabulary word from Realidades Unit 4A. In this activity the students will answer the questions using new vocabulary in real context. You can use it as oral or written practice or as a warm-up/exit ticket. For Realidades 2 4A.